Choose from the wide range of Dining Sets by Exclusive Furniture World. The Doral chair is crafted in traditional French oak style. The rounded top gives a delicate sense t.. This beautifully crafted chair is finished in semi- solid lacquered champagne frames with solid oak .. This beautifully crafted chair is finished in semi- solid lacquered champagne frames with soli..
Metal galvanised lead colour round table and 2 chairs. Measurements. Chair – w: 38cm, d: 44cm, h: 90..
Metal galvanised lead colour round table and 2 chairs. Measurements. Chair – w: 49.5cm, d: 51cm, h: .. The Orland large dining chair with wooden seat is manufactured using top grade oak. This ensures ext.. 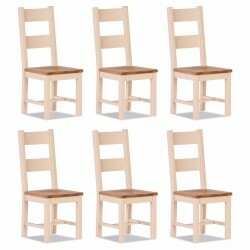 The Orland dining chair is manufactured using top grade oak. This ensures extra strength and stabili..